The Final AEMO Report on the big-SA Blackout deals up some hard truths, and contradicts its earlier claim that the “energy mix” didn’t matter. The key theme here is about the system inertia. The Blackout on Sept 28 last year was an accident waiting to happen, and it wasn’t storm damage to lines that caused it. The blackout would not have happened if wind power had not been so dominant. The transition to a 35% wind powered system left the SA grid very vulnerable. On Sept 28 last year, the safety settings on wind turbines were overly sensitive and when voltages “bumped” the turbines shut off suddenly, but those shutoffs hit the system too fast, and that caused the interconnector to shut off too, sacrificing SA to protect the rest of the national grid. The settings themselves are not the main issue — because they can be changed to prevent a repeat. It is a fixable problem — what is harder to fix, is the lack of inertia, and the sheer complexity. These are the biggest challenges of any renewables grid. We can fix even those problems, but at what cost in order to change the weather 100 years from now? The AEMO report mentions that the “intermittency” of wind power was not a problem, but that’s a strawman. It is true on the blistering scale that a grid crisis unfolds at, that intermittency is not an issue. (The graph in Figure 14 covers just five hundreths of a second). But on a longer scale the-intermittency-problem set the scene. Intermittency is a problem for the pricing, the market, and in the long run, it, and the subsidies to compensate for it, was what made cheap coal powered stations unviable. AEMO said unforeseen separation and complete loss of the Heywood Interconnector has occurred six times in the past 17 years. But in every other instance, the system stayed alive. “The key differentiator between the 28 September 2016 event and the other three events is that there was significantly lower inertia in SA in the most recent event, due to a lower number of on-line synchronous generators,” the report said. - The system inertia on the SA side was not sufficient to maintain the frequency drop (once the Haywood interconnector tripped) and to make the under frequency load shedding (UFLS) effective. This is a key point. This is illustrative from Table 11. The Heywood Interconnector has suffered a “complete loss” before. This time the system had more asynchronous (i.e. mostly renewable) generators. - The system inertia requirements must be carefully evaluated to ensure system stability in the event of extreme disturbances as the one that led to the black system. This is identified in the report. ‘Must run’ thermal generation may have to be identified. Synchronous condensers may be investigated as a potential solution if the thermal generation dispatch is expected to be low under specific load conditions. Generation mix is identified mentioned throughout the report as an important consideration from a power system security perspective. System Inertia: As systems lose inertia due to the retirement/displacement of thermal plants and the expansion of wind farms, frequency control becomes more important as frequency control is directly related to inertia. This report was very wise to note the relatively low level of inertia during this disturbance. The whole topic of frequency control and RoCoF [Rate of Change of Frequency] should be examined on a system wide basis and all devices that protect frequency should be reviewed for their appropriateness. The paper correctly states that the governor’s settings did not play an impact on the outcome of this disturbance. However, if it is impossible to consider under frequency schemes with higher activation frequencies due to frequency regulation, then this could be a sign that governor dead band needs to be reviewed system wide. The generation mix now includes increased amounts of non-synchronous and inverter-connected plant. This generation has different characteristics to conventional plant, and uses active control systems, or complex software, to ride through disturbances. With less synchronous generation online, the system is experiencing more periods with low inertia and low available fault levels, so AEMO is working with industry on ways to use the capability of these new types of power generation to build resilience to extreme events. As the generation mix continues to change across the NEM, it is no longer appropriate to rely solely on synchronous generators to provide essential non-energy system services (such as voltage control, frequency control, inertia, and system strength). Instead, additional means of procuring these services must be considered, from non-synchronous generators (where it is technically feasible), or from network or non-network services (such as demand response and synchronous condensers). The following factors must be addressed to increase the prospects of forming a stable SA island and avoiding a Black System: Sufficient inertia to slow down the rate of change of frequency and enable automatic load shedding to stabilise the island system in the first few seconds. This will require increases in SA inertia under some conditions, as well as improvements to load shedding systems combined with reduced interconnector flows under certain conditions. They could have said, we need more inertia so that South Australians have reliable electricity. But they didn’t. Your future is load shedding. Get used to it. Load shedding is the future. With Hazelwood gone, the first to be shed will be South Australia, then Tasmania and then NSW. It’s just a matter of size with six million people in Victoria and only 1.6 million in South Australian and 0.5Million in Tasmania. Really South Australia should buy Hazelwood and throw their windmills away, leaving all the nasty CO2 in Victoria where the wind will blow it over NZ and achieving everything the windmills achieve for a CO2 free South Australia. We would not object to receiving Victoria’s CO2. CO2 is what makes our bush so lush, and green, and full of bird life. It would be nice if we could export a few of our earthquakes, in return. Can Victoria then use the extension lead back to SA for the power it has lost by not owning Hazelwood? They could sell the electricity back to us. Of course. No need for new wiring. It’s all in place. This is just a question of ownership. Hazelwood is worth billions. Perhaps they could buy it for a song and they could use their windmills to generate the LGCs when no one wanted the wind power. It would make Daniel Andrews look silly, but what doesn’t? But that is business sense based, we all know that the politicians have a political agenda and for Labor SA to buy Hazelwood would be a breach of comrade solidarity. Our PM backed away from Abbott’s suggestion to buy it for the same reasons. Should load shedding occour it will preclude the national grid both generation and consumption. Load shedding presents Tasmania no problems – because it is underpinned by local Large Scale Hydro (excepting for a short period of madness, coinciding with an extended drought and an unmanaged technical fault, after merciless profiteering – under Gillard’s carbon tax). Were Tasmania highly reliant on just solar & wind, then they’d have a problem. Hydro Tas is importing 100 MW as we speak. (15:24) ADT Wednesday 29/03/2017. HT has been importing for the last week. Why? Who knows? Except that there is not a lot of run of rive available and HT probably wants to save the water in the reservoirs for a rainy day, so to speak. US Grid regulators are about the specify mandatory frequency reliability on all renewable energy sources eg windmills and solar farms. This means they will be forced to include batteries and additional systems to constantly simulate grid inertia. Once the true cost is apparent no-one is going to finance this without a government guaranty to distort the market to service finance costs if the renewable power source is going to be connected to a grid. Costs of wind and solar is about to at least double. I noted with interest that former Prime Minister Tony Abbott called on the government to seriously consider acquisition of the Hazlewood Power Station at least for an interim period while electricity supply is secured. His suggestion was of course rejected by the present Prime Minister who remains a renewable energy advocate and political agenda supporter. Tony’s suggestion was rejected by Turnbull simply because it was Tony who suggested it. It has ever been thus. I think Tony must have stolen Malcolm’s play lunch once. We already have the technology for partial load shedding in Australia. It is called DRED, demand response enable device. It allows the electric utility to disable your high power consuming device such as an air con or pool pump when the wind stops blowing. Most air cons sold in Aus or NZ now have this functionality, you just connect a signal reciever from the power utility (you will see whether it has it or not on the energy rating label, it will say DRM and mode 1, 2 or 3). At the moment it is optional and you get a rebate to install it. I predict it will become compulsory. I have an article on the in the April 2017 Silicon Chip magazine. About time for a little honesty and clarity on the problem of blackouts in SA. It is time everyone recognizes that the increased percentage of renewables in an electrical system means an increased instability unless they are matched by fossil fuel, nuclear, or hydroelectric percentage of continuous power supply. Everyone in SA should be frightened by what that pie chart represents, and the rest of Australia also because that’s what they have to look forward to under our current green governments. Take away the electricity welfare that SA gets from Victoria and they are living on a wing and a prayer. Now is the time to press the reality that the IPCC is a political body, not an Engineering one. And also that all the IPCC models have been shown scientifically to be wrong. The SA situation is a direct nod to coal & gas powered stations, and is a gift to realists everywhere. I always press this point when talking to rabid-lefties because it cant be disputed. When they fire up I say they are using stuff designed by engineers who also provide them with reliable power. If you really want to squeeze on a sore point, ask them to go without charging their beloved mobile phones…..that always gets them…. Senior officials of the UN explain the agenda quite well. Who is the journalist from The Weekend Australia who recently wrote that our politicians appear to be guilty of treason against our sovereign nation? Thank you. I appreciate the source material and the excellent summary. Since these findings are not unexpected…were the failures preventable? Do they constitute a criminal delinquency, or a somehow-justifiable “learning from one’s mistakes”? And who made the mistakes, and is there any evidence they have now learned how to avoid them? I would think it is time for political and legal investigations. I wouldn’t make that argument. You can’t make a complex power system that is 100% reliable as costs rise exponentially for each removing each remaining increment of risk. A well planned grid balances economics with reliability and public responsibility. The public responsibility (environmental) component was emphasized to the detriment of the others. Those planning and operating the grid likely were responding to weightings forced upon them. Politicans have a duty of care to explore all options and to be across the ramifications of all decisions. Ignorance of outcomes is no excuse. I have only scanned your report (which I think is very balanced, by the way) but the take-away for me, is that renewable energy needs massive redundancy, over a wide geographic area, with all of the timing and switching complexities that implies. In my experience, “redundancy” is anathema to politicians and non-technical bureaucrats, who can find countless other uses for the money. Renewable can only exist where normal market pricing is suppressed. That is a grid would normally pay a premium for supply that can be varied with demand. The beauty of fossil fuels – especially gas – is the ability to vary supply at short notice. Our RET laws from 2000 were intended to do two things. One is kill off the coal and gas generators. The second is to fund ‘renewables’ by hidden massive taxes inside the electricity bills for coal and gas generated electricity. Cunningly, the law has been crafted to avoid any mention of the words carbon or carbon dioxide, so now all our gas and coal electricity suppliers are going out of businesses and the politicians are pretending to by mystified while electricity costs soar. As a result, the industrial cost of electricity is now 10x that of the US, so making aluminum or refining metals does not make commercial sense. Incidentally the country’s largest timber mill is now closing as the Victorian government has shut down the renewable timber supply to protect an abundant possum. The same government just tripled coal royalties to speed the closure of coal power stations and legislated to prevent fracking or gas exploration. We will soon have no energy. At least there will be no need to vary supply at short notice. We will be back to steam engines and wood fires. I meant to say “normal market pricing is suppressed”. Yes. The Energy market is totally fake, burdened with a massive hidden carbon tax and a ‘market’ for worthless Carbon Certificates (LGCs,STCs) which is mandated, so it is not free. The pretence of a free market, as with all carbon taxes, is just a semantics game. With no apologies to the Beeb-Beeb-Ceeb, for the plagiarism. As I have commented below, consider the settlement discounts of 20 to 40 per cent being advertised for consumers who pay electricity bills on time …. a clear indication of very high profits. What you are missing is the high fixed costs… I have been carefully researching electricity and gas costs and the savings for usage are minimal. These discounts *are not* applicable to fixed costs. I thought John Cain was just inept, I’m now thinking like Andrews he was just evil and calculating. The sooner people wake up to the folly of big Marxism the sooner the real war can be fought and won. This might alert our politicians to the need for change. Ah yes, making coal clean again. I fully expect the Hansonites will go on the attack, we demand a debate and we want it now. A timely comment el gordo. Senator Malcolm Roberts was to debate Dr Karl, who changed his mind when he found he didn’t know about the ‘new facts’. Dr Karl acknowledged my depth of understanding and nine years researching the climate claim. He said the facts I presented to him on how the UN drives climate claims was new. Never fear! I am sure Brian Cox could rise to the occasion, in the absence of Dr Karl, and demolish Malcolm Roberts with the wave of a chart or two! Expect to some ABC rubbish to follow while they are in Oz. Dr Karl said he “could not find common ground”. This is a problem for us, in society at large, I recognise the malaise in Dr Karl. The thought that they may have got it wrong all these years is not worth contemplating, even though its good news that the world isn’t coming to an end because of human folly and greed. I’ve mentioned it before, humour is the only antidote to overcome the shock of facing reality. We will be back to steam engines and wood fires. No we won’t, not unless we are prepared to feel the weight of the law for illegally collecting wood, or paying $300 a tonne for second rate firewood collected by permit. Instead of stopping the Japanese from hunting whales, we may need to join them. In fact our carbon certificates which avoid the use of the word carbon, LGCs and STCs are far worse than carbon taxes especially the STC. This “Small scale” certificate means someone who installs a home solar system gets at least $5000 cash from everyone else for future CO2 savings calculated over 15 years. So we the public are not paying for actual CO2 saved, a rebate. We are paying today for CO2 saved 15 years into the future. We are paying future carbon taxes. It is perhaps the first time most people have been taxed into the future, a first for our political masters. I wonder whether that is even acceptable under the principles of Magna Carta which was a popular revolt against unfair taxation which itself forms the basis for the entire legal system. STCs may in fact be illegal. Actually as the RET imposes the requirement to purchase certificates for the sale of carbon based energy and the money goes to third parties who are not the government, the government may in fact have no consitutional right to create this penalty, these certificates and impose what is a tax on private commerce with monies which go to non government bodies, notwitstanding that this process is overseen by a government body. The whole LGC/STC business may be illegal in constitutional law, not even taxation to which the Commonwealth has rights. The government may have no right to force any party to pay another, neither of whom are government entities. The whole RET may be illegal and not supported by any power of the Federal government granted under the Constitution of Australia. Also as the coal and gas being taxed in this manner is exclusive property of the States under the constitution, this may also be explicitly illegal as a Federal tax on State property. Any constitutional lawyers available to confirm? I wonder, is “synchronous inertia” the same thing as “concerted political spin”? Don’t think so because ‘concerted political spin’ is a variable dependent on political standing of the moment and how close are elections. I wonder, is “synchronous inertia” the same thing as “concerted conceited political spin”? The RET is the problem. The entire problem. The Renewable Energy(Electricity) Act 2000. It has caused the problems in South Australia and now the other states. The more I look at this act and how it operates the more it looks like a really bad law. Unfair and unjust and possibly illegal. The ACt was framed with some really different concepts in what a Government can do. People are forced to buy pieces of paper allocated by the government from other people the government prefers, approved suppliers. No one mentions the word tax. No one mentions Carbon. The closest anyone gets is the word fossil which is what separates the two groups. 1. that we are taxed into the future, for fifteen years in the case of STCs. This is unprecedented. 2. we paying specific individuals not to produce CO2, not for what they do produce. 3. we also have to pay them for what they do produce, whether we want it or not. This is unjust. 4. this is not a tax and the money does not go into general revenue as taxation. It is not at all clear that a government has the right to force one member of the public to pay another, especially for things not delivered or wanted. Every part of the RET is sneaky and questions the very basis in law in which this massive carbon ‘tax’ on private individuals was introduced and in such way that it did not receive the proper inspection by the electorate which has repeatedly and explicitly voted against Carbon taxes. The RET must go. It is a bad tax, breaking many of the basic understandings of what Governments are allowed to do since Magna Carta. It is not even certain it is a legal tax let alone on just terms. Australians should not be paying taxes 15 years into the future in cash today to third parties who have not yet achieved anything which could be recognized as either goods or services. Repeal the RET. Whoever constructed this devious legislation intended harm to Australians and to deceive the electorate. To that end it has been very successful and very unjust. The RET is only half the problem. Priority access for renewables with no requirement for delivery, aka the “semi-dispatchable” designation, is the other half. BOTH are needed for renewables to operate. With just the RET, the government would get a big income from all the shortfall fines and electricity prices would skyrocket but our electricity grid would not be destabilised. Renewables are 1/3 to 1/4 the price of coal or gas, thanks to the RET. It is cunning to hide it randomly in your electricity bill. No one can even refuse to pay, to pit the Courts against the Government. However possibly One Nation’s Andrew Roberts or Pauline Hanson could challenge the constitutional validity of this weird law which is not legitimate taxation but a huge drain on the national economy destroying our energy sufficiency and sending our cash directly to private electricity companies and then overseas to strangers. The 15 year forward looking STC tax also breaks every tradition of Westminster government, taking cash from ordinary Australians to reward people for putting in solar panels for their own benefit? Otherwise it would require a High Court of Australia challenge to the validity of the Act, possibly by One Nation. There may be a mechanism for this to be done at National expense, like everything else but this time in the interests of stopping the billions of dollars flowing overseas possibly illegally. Repealing the RET (however appealing that is) will take monumental political will and persistence – do you see our government being capable of this? Redesignating the renewable generators so they have to operate according to the market rules is something that I see as far easier to achieve. If the government then has a huge windfall from the RET fines due to the renewable generators going out of business, then it takes the pressure off them to cut services or raise taxes. I’d be, not happy, but at least satisfied with that outcome. No need to repeal it. AFAIK, the amounts are proscribed by regulation, not legislation. I’ve been following TdeF on this, but otherwise am not knowledgeable about the question. I would love to be able to quote chapter and verse to my representatives at both state and federal level. Your plan whilst cunning (so cunning if it had a tail you would call it a fox)would simply mean the operators of wind plants would go broke, once broke they would no longer spin and no RECS being generated. The scheduled generators would then have no recs to buy and would have to pay fines. I am presently going through the Finkel review submissions. You may find support there for challenging the basis of the RET e.g. the Agriculture Electricity Taskforce need lower cost power. On the other hand I expect you would have difficulty finding any law firm willing to initiate a class action as there would be very powerful firms against such action. All those benefitting from the RET would be against such action; those with sunk costs in renewable plant along with their bankers and sponsors. You make a good point about the legal basis of the RET but I do not know enough about the legal framework to contribute on that point. The fact that SA is a major beneficiary of the transfer payments from other States may be one area to consider. I doubt that the Victorian government appreciates that low income earners in Victoria are supporting wealthy South Australians via their electricity bills. That adds a new dimension to COAG agenda. It would not be too difficult to calculate the transfers. Priority access happens because wind/solar suppliers can bid the lowest price into the NEM, because even if they get zero in the market, the RET guarantees them 9 cents/KWh by selling their certificates. That’s only part of it. Energy wholesalers are also forced to buy their output even if it is excess of demand (hence the negative pricing events) AND they also do not need to guarantee supply so other generators are left to pick up the bag when the wind/sunshine drops out. It’s akin the the management situation of authority without responsibility – you end up with chaos. They only get paid or pay for what gets sent out. Wind generators typically bid in at negative price as they have the LGC value as head room before it actually costs them. The negative price will force fossil fuel producers to reduce output. There is a cost for a large generator to turn down and come off line so they will accept a negative spot price for a period or two before it is cost effective to actually bring a set off line. Wind generators do not bid in at all. They just generate and sell and if they have a PPA, then they get that price. If not, they accept the market rate (which may be negative) and then sell the RECs to get their real income. And yes, the spot price can go negative due to slow response by baseload thermal generators. In Canada, the CANDU reactors can have their steam circuit switched to bypass the turbines (wasting heat energy) and this cut their generation to avoid this. The semi-scheduled generators have standing bids that carry over from day-to-day. They are inevitably large negative values to ensure they get dispatched. At this stage AEMO consider the negative pricing mechanism an effective control but as intermittent generators increase in capacity I envisage AEMO will need to have more effective and direct control over their output. To get 100% renewables the installed capacity needs to be up around 10 times the average load. Essentially there always needs to be excess capacity to demand, which means most of the time there is a HUGE excess. There are presently around 5 million Australians enjoying the benefit of the RET through LGCs, STCs and direct power subsidies. That is a powerful lobby. But since the retailers are forced to buy a proportion of renewable power, the windmill mafia can charge two to three times that price, a practice that in any other market would be known as price gouging. It’s a mouth-watering prospect for the merchant bankers and venture capitalists who were smart enough to jump on board, and brilliant news for Mercedes dealerships on the lower north shore, but of little or any benefit to the planet. This modelling highlights the cynical self-interest behind power companies’ calls to weaken the Renewable Energy Target. Companies like Origin and EnergyAustralia are pushing to weaken the target not, as they like to claim, because that would be good for customers, but because a weaker target is better for their bottom line,” said John Connor, CEO The Climate Institute. Various power companies and industry lobby groups want to weaken the RET, or to do away with it altogether. However, any change to the legislated target will need to be agreed by the Senate. “Some of the claims that have been made do not stack up against the clear evidence and are a distraction from who would really benefit from reducing the amount of clean renewable energy in the electricity market,” said Dr Cassandra Goldie, CEO of ACOSS. You may even find Cassandra benefits from the RET so there could be a conflict of interest there. I expect the RET battle is long lost. Raise your coffee cups to President Trump and his team this morning. EO removing many of Obama’s climate policies has been signed. Three cheers for Donald the Great. Is this indicative of green thinking:- poor models coupled with insufficient testing. Seems as though they got a few engineers in to do this report, which is why all of these errors and omissions are now in the public domain. No wonder the complexity of global temperatures can not be simulated if we are having trouble with a few wind generators. Nothing new in this final report – basically a summary of the earlier findings and actions. It’s disheartening to hear the AEMO pronounce that the changes to the wind farm settings would prevent the same issue given the same circumstances (and that wind intermittency was not to blame). That level of hedging is unworthy of a organisation of this nature and importance. Exactly AnaltiK, the report contradicts itself , settings on wind turbines were to blame but renewables weren’t . There was probably a deal of political pressure to give Weatherill an out. Who would want to deal with him throwing a tantrum? When I saw the heading for this thread I thought: at last, those running the AEMO have seen the writing on the wall and decided to get themselves out of the position they have been placed in. Further reading of the commentary however, showed that it wasn’t that clear cut and that there was a fence siting exercise going on. There was a little bit of something for both sides. But back to the AEMO. Its primary function must surely be to organise the distribution of cost effective reliable electricity to households and businesses. If it was following this charter it would immediately recommend coal or nuclear based power and the removal of expensive, disruptive renewables. The extra cost of integrating renewables into the grid is mentioned but not really highlighted. Meanwhile the basic issue of running an engineered system with serious political constraints gets left out of the discussion. The basic issue behind this mess is the vilification of CO2 as a dangerous gas. As outlined in a recent post ( http://joannenova.com.au/2017/03/hazelwood-the-shutdown-begins-lowest-cost-electricity-forced-out-by-government-decree/#comment-1902239) there is no scientific basis for claiming that HumanKind is able to affect the climate through production of essentially minute amounts of CO2, we are a quantitative irrelevance on the face of the Earth. Both Will and CO2Isnotevil have engaged in long exchanges over the heat exchange mechanisms possibly involved but whatever the outcome there, the fact is that humans are quantitatively irrelevant. I have said that twice because it is the crux of the matter. Politician are doing the world immense damage and need to be stopped, turned around, and made to face reality. Germany spent over a billion euros trying to stabilise their it’s power grid. Before the introduction of solar and wind power generation it had been considered the showpiece of electricity grid stability. Jennifer Marohasy is editing a book (dedicated to Professor Carter) and is expected to be out in June. Customer delivery manager Mark Biffanti said cyclones can potentially impact solar PV systems and it is crucial that customers take steps to ensure their own safety and consider the safety of emergency crews. “It is critical to remember that solar panels and their cables should always be treated as if they are live. ***During network repairs or maintenance, customers with solar PV systems may be required to shut them down at the inverter if Ergon Energy uses generators to supply temporary power while crews work on the poles and wires. Ergon customer delivery manager Mark Biffanti said Ergon’s restoration plan was well under way but restoration crews could not be sent to affected areas until it was safe to do so. 6.05sec, David Lipson: “Do we need another inter-connector though to get to South Australia? It’s a long way to go around and, as you know, electricity is lost the further it goes. Note: When jumping large sharks, a larger boat is recommended. OT from their ABC some fake news that should have been checked by them before going up . How do I know it’s fake spent two months in SA two years ago , and seen plenty of Zebra finches ,restless tree creepers etc . Hmm. Must tell my friend that those finches in his garden don’t exist because the ABC says so. An alternative explanation for the wrens only living in Victoria is that even a bird brain knows that SA is no place to live. I doubt that we will see anything bad happen but if it did the PM of Victoria will have to resign and call for an election. This madness has to stop and be reversed one day. I see Trump just signed order dismantling Obama-era climate policies to make coal fired power stations great again. In France both major parties (socialist left and republicans) are heading for extinction. We need the same to happen here. I smell change in the air all over the world except here in Australia. When are we going to wake up? My bet remains 18th June for the first load shedding but it will be interesting watching what happens once HWPS is no longer producing. Now that inertia is on the table I wonder if AEMO has the Victorian network inertia adjusted for no HWPS. Finkel’s preliminary report discusses inertia and quite a few submissions offer solutions. Some argue that stability and security services should be a separate market. Yep that means more costs to um?? consumers. The energy is free but the service charges to make wind and solar practical sources for the grid is VERY expensive. By the time all this is worked through there will be home made solutions that are more economic than trying to power the NEM from the wind and sun. The only industrial power user still viable will be generating their own power. Places like Yarwun Refinery may get unexpected income from their “inertia” service. No money in alumina but lots to be made from having the turbine on line. Unit two began the shutdown procedure at 9.10AM, and was back at zero at 10.45AM. Just Unit i on line now and generating 161MW. The end is near, never to run again. Unless they wind drops out and we have a cold snap in the next couple of weeks. Then Jay DitherDill will be screaming for the old soldier to be returned to service. That’s something that will never happen. Once that last Unit runs back to zero, that’s it. It would cost hundreds of millions of dollars to jury rig it back to some semblance of operation, and would take literally many Months. There’s too much that needs to be done to it. I’ve heard that the main point in question was the boilers needed a complete overhaul, if not replacement, and the due date for that was April 2nd. The generators will have settled on the shaft now, the systems have been purged, the turbine would need a complete flush at enormous cost multiplied by eight. Perhaps while the plant was still operational, they could have been able to do one unit at a time, but the time factor for that would also be many Months, for almost the same cost, way too much. Now it’s closed, that’s it for Hazelwood. And I’ll say that again ….. 53 years. Wind plants can only dream of that sort of longevity. 15, 20 perhaps 25 at the absolute outside, but 53 years from a relic 4 technologies old, and the latest tech turbines on poles will be lucky to make a fraction of that time, for an even smaller fraction of power delivered. During its life, Hazelwood delivered around 520TWH of power. Every wind plant currently in Australia (at a Nameplate of 3900MW or 2.44 times Hazelwood’s original Nameplate) would take 51 years to deliver the same amount of power, so that’s every wind plant now, and their total replacement, and then half of a third total replacement. Unit 1 dying right now. Perhaps now? Unbelievable that the wreckers can act so quickly. This will be surely be one of the major initiatives from the newly installed CEO Audrey Zibelman, who was most recently the head of New York state’s ambitious “Reform the Energy Vision” program and its target of reaching 50 per cent renewables by 2030. A smarter quicker grid….no…more large rotating machinery instead….. It seems people want to fiddle around the edges, not actually address the problem…. A bit like trying to milk the fuel efficiency thing, not invest in breakthrough hydrogen-from-water tech which would be a paradigm shifter…. explains the softness of AEMO report?? This load sharing business among the states is silly. It was never intended to allow one state to be so heavily reliant on renewables at the expense of others. How can SA be so openly arrogant to say they are the leading renewable state when in fact they rely so much on coal power from Victoria to maintain their very existence? Also “sucking” power from Victoria could lead to load shedding or worse in both NSW and Victoria just to allow SA to have continuous power. It’s not only unfair it should permit any businesses that suffers to claim damages and more. This really has to stop. Turnbull should now step in and enact appropriate legislation and powers to reverse the imbalance. That would mean an immediate cessation of any more renewables in SA and possibly Victoria and new gas or coal fired power stations in SA to promote a more evenly balanced sharing of power. NSW can proceed to more renewable if they want to be silly but given electricity prices are already far too high they do so at their peril. The only real solution of course is the demise of both major parties and the formation of two new major parties with common sense and logic. Of course it won’t happen overnight but unless the existing major parties change dramatically (highly unlikely) the public will eventually suffer so much pain with either catastrophic power outages or extreme costs or both. The public are fools now but they are not so foolish to keep taking in all this BS forever. Eventually it will all change – the only question is when. How quickly we forget the lessons of history. This is not an easy thing to explain, but I’ll try. Look at that pie chart Joanne has in the body of her text. The whole pie is maximum demand, the power being consumed, and is being supplied by the mix of power generating entities. Now, here I have added a link to wind power generation for South Australia on that day, 28Sep2017, and that is at this link. Now, when the link opens, see the graphs in the middle of the page there, well at the top right hit the MW button. Next, under the list of Plants which have all their boxes ticked, look directly under that, and you’ll see the buttons for each State, Total and Sub Total. Untick the Total button, and all States except South Australia. You now have a black line on the screen, and that’s the Sub Total, in other words all the power being generated by South Australian wind plants, the coloured squiggly lines at the bottom of that graph. Now, you can see the exact instant that the power failed, and went from (around) 900MW back to zero instantaneously. Okay then, now go back to the pie chart, keeping in mind what I said about the whole pie being the total power being generated and consumed. Take out even a couple of those wind plants, because of the tripping off caused by sensitive settings or whatever. What you now have is a whole consumption, and not enough generation to cover that. The ‘system’ looks around for more power to cover what is lost, and cannot find it. This overloads the rest of the generators. More wind fails because of settings caused by frequency change and not enough inertia, and as each wind plant drops out, the ‘pie’ goes looking for more power to cover it. There is none, and now, to protect the remaining power plants, now overloaded, they also trip off line, and the same happens with the Interconnector, now also overloaded, so it also trips off line. It was a cascading failure. It may have originally been caused by the loss of transmission from just one of those wind plants, which then caused another to exceed the fault setting. Keep in mind also that those fault settings include isolating the plant in high wind situation to protect the turbines, which shut down, and have the blades ‘feathered’. So, in a high wind situation which there was at that time as the front came through, a seried of wind plants, umm, exceeded their, umm, sensitive trip limits, and so on, all of it in that 0.6 second time frame from the first one going down. Having a series of 18 wind plants would have exacerbated the problem, and look at the map of where they all are, basically in two long lines, so, as soon as the front hit the first line, their ‘sensitive’ trip limits shut them down, and the ‘pie’ went looking for power to cover that loss, and their being none, they all went down, as a form of protection against overload. You can have 18 wind plants subject to high wind situation, or two large generators of the now closed Northern power plant, not subject to the high wind situation. Okay then weaken those sensitive settings by making them, umm, not so sensitive, and there’s the chance you now expose those wind plants to higher winds than they should safely be operating within. I hope you can see the point here. Had there not been 18 wind plants with around 930 turbines on poles, when it takes very little to have some of them fail, which leads to that overall cascading failure for ….. ALL the power, no matter from what source, then there is every chance this would not have happened. And the lesson from history I mentioned at the top. Note the early failures and what caused them. Note how the system then went looking for replacement power. Note the time sequence from the 4.05.57 Mark, and how in barely seconds, the whole N.E. of the U.S. was blacked out, and that grid is humungously larger than that of South Australia. After the initial AEMO interim report, I advised AEMO of the cut-out speeds of the turbines in SA, and was assured that they would consider that as they proceeded. I’d hoped for at least a considered analysis of their impact by the final report, but your’s is the first I’ve seen. Is this falsity by omission? What happens when all the thermal power plants are put out of business? What economic model do the unreliable generators follow then since they won’t be receiving the 9c per kWh from the thermal producers? If you are not producing your own power your are paying the 9c/kWh for the LGCs through retail charges. The thermal generators do not pay the LGCs but are disadvantaged by it. The LGCs enable the wind and solar sources to bid in at negative prices so are always the first dispatched. The thermal generators have to adjust for the variation in wind and solar. It is not economically feasible for all the thermal plants to go out of business (although that it not e prerequisite for saving the planet). There is a change to more gas fuelled thermal plants than coal because they can respond faster to the variations caused by wind and solar. The emerging definition of 100% renewable is “100% renewable for one period in one day of one decade supported by fast response gas and diesel generators”. Wartsila are salivating at the prospect of all the large diesel generators that will be scattered throughout Australia to support the NEM security needs. The renewables do not bid in. The “semi-dispatchable” designation just lets them dump power into the grid and the spot pricing goes haywire. Otherwise you would not get negative pricing events – the AEMO would not allow a negative bid plus the bids require the time the power will be delivered and the amount. The PPAs and RECs protects them from the low/negative pricings so they still get decent income for the power they generate no matter what the market price is (if it’s positive, then that’s a bonus for them). Should have been “the time the power will be delivered, the duration and the amount”. When generators do not deliver according to their bid, they are violating a contract and fined for the amount it cost to cover any shortfall (or just flat out fined for any excess). 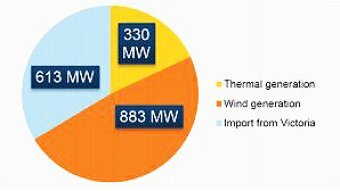 Of course the renewables cannot provide any of this despite all the claims that they are highly predictable which is why I maintain that removing the “semi-dispatchable” designation and making the “predictable” renewables bid into the market is sufficient to remove them from disrupting the grid. The standing bids for the renewables are just the placeholders used by the AEMO to give the renewables priority access in their reporting systems so that they didn’t have to rewrite them. But the bid pricing is not applied to the power they produce – they are paid the market rate at the time (set by the price dictated by the thermal generation to meet the demand ex-renewable generation). And they do not have to set any time constraints nor power output. These bids are not used for pricing purposes. They are standing bids at negative prices to guarantee they will be dispatched. All generators producing over any period get the same spot price irrespective of their bids. The dispatch price at any interval, averaged over 30 minute periods to get the spot price, is the highest cost of all energy dispatched in that interval. It has nothing to do with the offered price unless it happens to be the highest priced power dispatched for any interval. It will be time to pump BS uphill, if TurnBull’s feasibility study is finished by then, and he has another ‘cousin’ to head(fleece/mismanage) the project. What if the evaporation rate of increased water surface area to the pumped catchment is higher than, matches or just greatly reduces whatever will be gained from the later release of water for hydro-turbine driven power ? What happens in a drought when there is little or no water to pump back up ? Where is the ‘replacement power’ for Hazelwood come from in the 7 year plus meantime ? Why are we switching off a reliable superior power source without a backup for that source? Hazelwood was at max power up until its closure, but is being ignored as if it has been off? Who are the imbeciles and ratbags making these diabolically bad decisions ? I suspect the pending answer from our esteemed leaders and CAGW fanatics would be: ddddaaaarrrrr ! I doubt it will get to that because I don’t believe the people or even the politicians are that foolish or blind to what the impact will be if all the thermal power plants are put out of business, not even for the ALP – the Greens yes they are that blind they would let it happen but fortunately they are not in control. The impact would clearly be catastrophic not only to our economy but also to our society. Civil unrest would be extreme and the military would need to be called upon. I have enough confidence that the politicians will see the writing on the wall soon enough to change their direction. Am I being too optimistic or delusional? Perhaps. Time will tell. The grid will collapse. There would be no power for Mal’s SMS2. There would be no power for anything. If Hydro is al that’s left that is synchronous, ( insert deity or preferred idol here ) help us. Renewable Energy Target …..leftoid for Forced intermittent toy energy use to achieve national deindustrialization, loss of prosperity, and general destruction of the middle class. “dollops of cash” to be made…but for whom? wonder where Sir David King will turn up next! Britain has told the Trump administration that global efforts to combat climate change must be continued, the foreign secretary has disclosed. Boris Johnson said that he had raised the issue with White House officials and his US counterpart Rex Tillerson,secretary of state, while visiting Washington last week and that there were reasons to be hopeful. “I’m not saying we’re there yet”, Johnson told a gatheringat the Foreign Office on Monday night. Mr. Johnson was speaking at a reception to mark the work of his outgoing special representative for climate change, Sir David King. The foreign secretary gave an assurance that Sir David’s work would continue under his replacement, Nick Bridge, a former chief economist at the Foreign and Commonwealth Office who has held postings in China, Japan and the US. ***Pointing to the large offshore wind farm investments made in the UK in recent years, Mr. Johnson said there was a compelling argument to be made that “you can cut CO2 and also make huge dollops of cash”. Only a third of the value of new UK offshore wind farm projects is being spent with British companies, according to analysis. The balance has reached a tipping point where the UK will start to see a “net benefit” from future projects, however, as subsidy costs fall and the proportion of investment spent domestically increases. Offshore wind turbines with a capacity of 5.1 gigawatts (GW) have already been installed and their number is increasing, with 10GW expected to be generating by 2020, supported by billions of pounds in subsidies. And to what good end? Or should I dare ask? I’m no power engineer but even an amateure at this stuff can figure out that it will cost more than anyone imagines and after it’s all done it may not work right. Why are politicians such fools? But good for the ABC for a change. ‘cos renewable energy is free! Rhymes with whee and means about as much too. Free is always worth what you pay for it. 27 Mar: New Yorker: When Is It Time to Retreat from Climate Change? I can see a “perfect storm” coming with regards to pensions, supers and real-estate. If our electricity prices keep rising and the stability of power keeps falling then company profits will decline and company investment in Australia will dry up. The end result is our stock market will be in free fall. Guess where all the money will go? Real-estate. That bubble will go to such extremes it will surprise all. When that bubble bursts stand aside! The real-estate crash will be one for the record books. I hate to be a spoiler, Pat. But what had climate ange to do with any of that? This report linked by Jo above is very suspect. Let me point out a few details that make the reading of this report extremely biased. They begin with a third party disclaimer. Which probably is required by law, but it makes clear, they were bought and paid for by AEMO. Their first comment: ” … review is very well written…” gotta make sure that we insert very because a dry clinical report just won’t do. Second: “AEMO’s efforts to understand the system study model response are excellent.” Wow, they feel AEMO is trying real real real hard to understand the problem. 4:”…The reviewers commend AEMO on a very well drafted report.” Oo oo, MHI who was paid for by AEMO commends them for being soooo…. good and effective and smart. 5: ” it is reasonable that AEMO did not consider…” what? 6: ” AEMO has performed a significant amount ..” wow, they may have attempted to do their job? I don’t want to impune D. Muthumuni but there appears to be a conflict of interest. The third party was contracted and paid for by AEMO. Very very lame to believe this reivew. I just read Jo’s post, didn’t bother to read it. Your comments make me glad I didn’t. Thanks Timo. Here in Newcastle a year or two back we had a power outage that went for nearly a week. A month ago power was denied to our only surviving aluminum smelter at Tomago. Industry is leaving S.A.
ALL of these shutdowns were avoidable and only occurred because politicians are playing God and overriding qualified engineers. Vote them out then prosecute them for vandalism. I have mentioned this previously but received little feed back. We are all well aware that electricity prices for consumers have increased substantially beginning when so called renewables were added to the electricity grid supply, and continue to rise at rates of increase well ahead of the rate of inflation generally. My query relates to account settlement discounts being offered by our billing companies. I have been aware of settlement discounts being advertised from 20 to 40 per cent for payment on time. When I was in business 2.5 per cent was often offered for settlement of accounts on time. Therefore the question should be asked, why (obviously) are profit margins so high that settlement discounts as high as 40 per cent are possible? Does this relate to renewable energy surcharge and subsidies that are causing power stations to become commercially unviable, and if so what excuse can there be apart from the climate change political agenda? Dunn & Bradstreet are a service to business where all kinds of statistical information can be obtained, for example what is the average percentage profit on sales for your industry. For manufacturers generally it used to be 5-10 per cent profit before tax on sales was the average range. So how much profit margin does the electricity supply business achieve to be in a position to offer such high account settlement discounts? I remember when the carpetbaggers and rogues only sold you a monorail which you could dismantle once the fad had fizzed. Nobody added to a monorail or tried to fix it. It just got ignored for a couple of decades then someone took it away. Can we convert useless submarines to wave generators and hook them up to the SA grid (in fifty years time if all goes well)? What’s next from Big Afterthought? We can fix even those problems, but at what cost in order to change the weather 100 years from now? In any case, the effective halflife of the anthropogenic component of CO2 emissions is about 25 years (and reducing), so in 100 years only about 6% of present emissions will contribute to any AGW effect. Jay Weatherill has run out of other people to blame. The South Australian Premier must face reality and deal with the dire consequences of his own energy policy mismanagement. As an evangelist for renewable energy he has charged headlong towards a renewable target of 50 per cent. The result is the nation’s most expensive and unreliable power and SA’s first statewide blackout or “black system”, as engineers dub it. Mr Weatherill first blamed the weather, then the market, then Canberra, and even accused this newspaper of running a “jihad against renewable energy” — so we figure he blames The Australian too. Deputy Prime Minister Barnaby Joyce has rubbished the ACT’s 100 per cent renewable energy target, describing it as “completely insane” on Tuesday morning. “The ACT saying they want 100 per cent renewables is crazy,” Mr Joyce told the ABC’s AM radio program. Shane Rattenbury, the ACT’s Minister for Climate Change and Sustainability, hit back at Mr Joyce in an open letter posted to Facebook. “Let’s talk about crazy for a moment,” Mr Rattenbury began. “Crazy is denying the benefits of the ACT’s investments in renewable energy projects across the country, including the Sapphire Wind Farm, which is coming soon to your electorate of New England. “Crazy is denying the at least $10 million and up to 200 construction jobs this renewable project will bring to your local community. “Crazy is ignoring the impacts of climate change on rural communities, including more severe droughts, bushfires and the loss of productive farming areas. Mr Rattenbury added that the ACT was proud to have set itself such a tough renewable energy target. “In the ACT we are well on the way to achieving our 100 per cent renewable electricity target by 2020, by securing contracts for around 650 Megawatts of new solar and wind generation,” he said. The headline article in The Adelaide Advertiser today is that Weatherill rejected a suggested plan from Alinta to keep the Northern Power Station going for 3 years. Alina wanted $25 million over 3 years, but this was unacceptable to the Premier, so they shut down and the Premier ordered the Power Station be dynamited..
We now have Jay Weatherill’s Energy Plan for SA being spruiked on TV, on the internet and in newspapers. It will cost $550 million (and given previous plans by this government that is a heroic call) and may work – there is no guarantee that there won’t be further blackouts. So we have a Premier who thinks that $550 million is smaller than $25 million, which might explain other cost over-runs, but does that fill you with enthusiasm?. Once upon a time many voters considered politicians to be untrustworthy. Is there now any doubt whatsoever? Interesting to note that China Power International Holding has started work on a new US$2 billion coal-based power plant in Pakistan’s Balochistan province. The 1,320 MW plant is due for completion in 2019. This is just one of hundreds of new coal fired power plants being built all around the word – except of course Australia who happens to be the biggest exporter of coal in the world. How ironic and how foolish we are. Oh BTW. Turnbull’s plan for an expansion of the Snowy Scheme will cost roughly the same, take many more years to complete (if ever) and produce not even 1 Watt of additional total power, and in fact is worse since it would consume more than it generates overall. Can’t still figure out yet why Australians (in particular the voters) are in so much of a hurry to crash and burn. Australians have been systematically dumbed down by the “education” system, SBS and their ABC for a very long time now. Plus, Australians have never known any genuine hardship, the wealth just kept on flowing – until now. Compare us now to Argentina or Venezuala. Thank the Left (including the Turnbull Liberals) for putting us there. And if voters choose to pass government to Union controlled and managed Labor & Greens the result would be further left agenda. On the ABC it began with Play School. Sesame Street is another. Both highly manipulative. I keep asking myself why a nation with such a small population of 24 million representing about 2 per cent of the global economy is being targeted for economic collapse? The journey of a thousand miles begins with one step. I reckon Lao Tzu might have been on to something. Britain’s government presented new regulations to Parliament on Tuesday which it said will exempt certain heavy industries from some of the costs of a renewable energy support scheme, saving them around 100 million pounds ($125 million) a year. Businesses with high energy consumption, such as chemicals, steel or cement producers, have long complained about rising costs from Britain’s climate change policies. Separately, the government is pursuing discussions with the European Union to seek further exemptions from policy costs for energy-intensive industries, it added. None of this is therefore a snarl at climate change worriers, nor even a discussion of climate change itself. It’s just the point that the Sierra Club has the economic argument backwards here. They’re touting how many jobs there are in renewables. But that’s evidence of how expensive renewables are, not how cheap. Because human labour is a scarce resource and thus using more of it is more expensive. Even in fossil-fuel rich countries such as Australia, where the Treasurer brought a lump of coal into parliament in February to taunt critics of the government’s approach to climate action, the government is so far sticking with its Paris plans. Perhaps Mr Trump’s move will embolden countries like Australia to follow suit, but this seems unlikely any time soon, especially if the fruits of the president’s endeavours fail to materialise as quickly as he hopes they will. meanwhile, celebrations all around for Renewables’ Scotland! Hurricane Energy said one billion barrels of recoverable oil could be contained within the Greater Lancaster Area, 60 miles (97km) west of Shetland. The company hopes to begin production in 2019. The State climate change watchdog says the Government’s draft plan for reducing carbon emissions lacks substance, detail and analysis about how the objectives are to be achieved. Pakistan’s former government, led by President Asif Ali Zardari, introduced a comprehensive National Climate Change Policy (NCCP) in 2013, but it languished under the successor government of Prime Minister Nawaz Sharif. The government will appoint federal and provincial ministers, chief ministers and chief secretaries as members of the council. Would you believe it, but as Hazelwood shuts down, SA is currently supplying 213 MW into Victoria. However, Vic is also sending 135 MW to Tas, and 105 MW to NSW. And in SA the current spot price is -$45/MWh, yes they are paying money to others to take their surplus power, because those wind generators get paid an extra $90/MWh through selling their “”clean energy certificates” per the RET legislation. But the forecast for tomorrow morning is that SA will again be paying over $250/MWh as the wind drops again. Yep, that’s the market distortion by the twin evils of the RET and the market priority access beautifully demonstrated. I wish the AEMO had an overall view on their site that could be snapshotted to illustrate this. The term “renewables” is practically meaningless. It implies that anything not “renewable” will run out. While no resource is infinite, we have many centuries or even millenia worth of coal reserves and as for nuclear we have many centuries or milennia of that as well. For practical purposes, existing reserves are essentially limitless and therefore renewable – you just dig more coal or uranium out of the ground. In the uranium civilian nuclear fuel cycle, the nuclear “waste” that is buried still has about 98% of its original energy. It truly is a waste to bury it. It should be reprocessed, and incidentally, the more energy that is extracted the less radioactive it becomes. We also have thorium of course. Eventually some resources will run out but in the free market of capitalism, when resources become scarce their price rises and the marketplace finds alternatives at lower prices. In the free market, you will not run out of what you need. At some point, which is always 50 years into the future and has been for at least 50 years, fusion power will likely become available providing limitless amounts of cheap energy which will even enable the chemical synthesis of hydrocarbons for transport since it is unlikely that there will be small fusion reactors for cars. There is no possibility that civilised society will run out of the dispatchable energy it needs. There will no civilised society if we rely on windmills and solar. Anyway, how did the term renewable come into use anyway? Wasn’t the whole point that wind and solar were zero CO2 and not renewable? can’t open the following – quota used up! The impact will be more pronounced for big businesses which buy their power on the wholesale spot market. In December, in the wake of the Hazelwood retirement announcement, the Australian Energy Market Commission (AEMC) predicted SA power bills would surge by 7.2 per cent next financial year, adding about $115 to the annual bill of an average household. Once a week, the Australian Energy Market Operator (AEMO) updates its medium-term forecasts for electricity demand and supply. Seven large-scale solar projects were completed in 2016 and even more will be built over the next 12 months, as rapid advances in technology propel large-scale solar towards price parity with wind power. Clean Energy Council CEO Kane Thornton said it was “a record year” for large-scale solar, which could soon overtake wind as the cheapest form of renewable energy, thanks to rapid advances in technology. (Moree mayor Katrina Humphries) said there was a great deal of community support for the project — especially in light of the summer they have just had. “We’ve been an area that’s suffered from a lot of blackouts,” she said. Matthew Warren, chief executive of the Australia Energy Council, which represents electricity networks and retailers, said solar’s cost relative to wind, gas and coal was more complex than it appeared. “We don’t get into this game because it’s not just the levelised cost of energy, it’s not just the cheapest unit cost of electrons,” he said. South Australia’s Pelican Point power station will be returned to its full available capacity of 479 megawatts within the next three months, its owner ENGIE says. The announcement came on the same day the company turned off its 1,600MW Hazelwood power station in Victoria. Premier Jay Weatherill said the deal would not have been reached had Port Augusta’s coal-powered station remained open. my comment which was in moderation is now posted – see #38 beginning “more Govts doing nothing” if u wish. I hereby offer to donate $500 to a class action that the RET is unconstitutional, and therefore illegal. Any takers? performance is used to identify triggers and possible vulnerable lines for such weather events. line was constructed at different times, and to different historical standards. Local terrain is also a factor. In SA, ElectraNet has advised that these specific lines may be vulnerable to high wind speeds.  Brinkworth–Davenport 275 kV line.  Brinkworth–Templers West 275 kV line.  Para–Templers West 275 kV line.  Torrens A (TIPS A)–Magill 275 kV line.  Davenport–Mt Lock 275 kV line (with temporary structures).  Davenport–Belalie 275 kV (with temporary structures). Which basically says: we never considered high winds in groups of windfarms, even though geographically located together, since it was not thought about and real hard! That portion of AEMO report reads like a snow job. They seem to be claiming that they had covered design requirements for individual events, but then strangely suggest that the system failed because so many events came simultaneously. If each individual stressor was covered then it won’t matter if they all come at the same time. This is the sort of trendy sciencey type logic that bluffs the masses and keeps them in power. It is the US House science committee hearing into climate science. Does not start till 15 minutes in. Curry starts at 36 minutes, Christy 40, Mann 45 and Pielke 51. I have not watched the whole session yet. Mann spends the first minute telling everyone how good he is then goes on to say he represents the consensus. Cyclone Debbie, transmission towers “folded like cardboard” as reported in the media. No statewide blackout. Just saying. In the mean time ABC has an all encompassing discussion with Scientist Brian Cox. He recommends that there should be no more discussion on Climate Change as those ignorant of the Science may be able to influence the public.